This book introduces some 75 species of wetland birds to readers through the eyes of Kate Humble. As she freely admits herself, Kate is still learning her birds, so to find out more she contacted Martin McGill of the Wildfowl & Wetlands Trust to act as her guide. Their birdwatching sessions together form the basis of this book. As Kate learns the difference between a Canada Goose and a Barnacle Goose, which ducks dive and which ducks dabble, and how to tell apart those little brown jobs that warble from the reedbeds, so she passes on the information to the reader as she goes. The effect is not dissimilar to the Last Chance to See series, in which Mark Carwardine and Stephen Fry scour the world for endangered species. The difference between Canada Geese and Barnacle Geese? Just remember that the C-anada goose has a C-hin-strap. The Teal is the Ziggy Stardust of the duck world, while the Shoveler feeds as though it's dropped its contact lenses. Each species takes up approximately two pages, complete with photographs and illustrations to bring out the key identification and behavioural points. The birds are divided into simply titled groups - large waddling birds, little brown jobs, and so on. Other chapters in the book cover topics such as basic equipment, clothing, hide etiquette and more, each written for the beginner in Kate's style. Paperback; 256 pages. 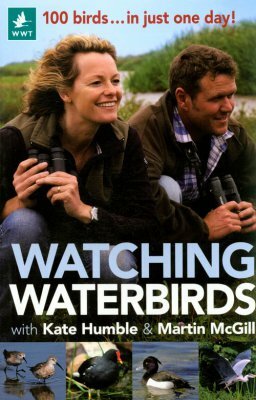 About the Authors: Kate Humble is Vice President of WWT, President of the RSPB and co-presenter of Springwatch and Autumnwatch. Martin McGill is a senior warden with WWT, based at Slimbridge.